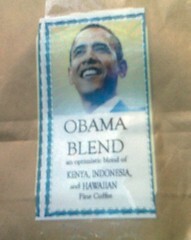 My sis brought me a bag of Obama blend coffee today - a mix of beans from Kenya, Indonesia and Hawaii - pretty cute. Considering that she was the person who left me a long comment (on my post I wrote listing all the reasons I was voting for Obama) telling me why I shouldn't vote for Obama, it's a really sweet gesture. And pretty good coffee, too! I'm drinking some right now. I feel for you parents. I mean, I KNOW having a dog isn't the same thing but there are times when I get a glimpse of the heart-wrenching horror you go through on your daily quest to balance good parenting with helicopter parenting, with wanting your child to grow up and be happy and independent and OMG THEY ARE GOING TO KILL THEMSELVES I JUST KNOW IT AND I WILL BE THE WORST PARENT IN THE WORLD HOW CAN I LET THEM RIDE THAT SKATEBOARD I JUST KNOW THEY ARE GOING TO DIE DIE DIE. My dear dog Goldie's favorite thing in all the world is to chase birds on the beach. Since she can run a mile in about a minute and I can run shuffle about 200 yards before collapsing, this means she goes off leash. And when she goes off leash, she loses her hearing and her normal devotion to me. She is in the Zone, the Bird-Chasing Zone where the only thing that matters is that seagull down the way. For a mostly sedentary dog, she can go for a surprisingly long time, too, racing up and down the beach for 45 minutes as if she had had a transfusion of Seabiscuit's racehorse blood. I just have to watch and wait, because she is not at all under my control. Sometimes I can just see a tiny dog-colored speck in the distance. Sometimes I lose her altogether. I can yell, I can wave, I can whistle, and she will not come. Why do I let her do it? Why did Tony Hawk's parents let him go on a skateboard, though they had to go through child-abuse grilling by emergency room staff every time they brought their bruised, broken, skinny little boy in for treatment, which was often? Because it is irresistible to let them do what they really love and are really good at. It is a risk you have to take. But tonight was almost too much. It had been a super sucky day at work. 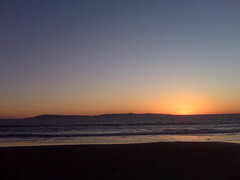 As soon as I could escape, we went to the beach. It was about 4:40 pm and she started chasing birds. When the sun went down at 5:20, she was still chasing birds. And as darkess really started to fall 10 minutes later, she was still running, even though she could hear me calling her and whistling and waving my arms and walking up the path to leave. She kept running even when I went out knee deep in the water to catch her, zipping past me with the ease of Magic Johnson eluding a Celtics double-team (oh, those were the days). Finally she got tired and I got near her. I had to go out waist deep to grab her and I was so scared and tired and just...cooked by then that I lost it like a mother of triplets in Wal-Mart on a Sunday afternoon. Screaming. GOLDIE GOLDIE GOLDIE G*DDAMNIT GOLDIE GET OVER HERE RIGHT NOW! RIGHT NOW YOU GET RIGHT OVER HERE! RIGHT! NOW! YOU DOG! I did not beat her. I did not strangle her. I did not leave her behind. But I wanted to, and I told her...well, screamed at her...that I should have done all those things, and that we were never, ever coming back to the beach. In other words, I lost my parental sh*t. Even if my child was a just a dog. I think I may have broken my voice. I know I scared her by yelling, but she got over it by the time we crossed the railroad tracks and she peed on the iceplant. That's the difference between dogs and kids, and I'm glad for that.